I thought you might like to see the shed makeover that my husband Rob undertook when we took on our first allotment last year. This was quite a task as the plot was very overgrown to say the least. I thought the shed would need to be taken down b Rob said he could fix it and, true to his word, he fixed the fallingdown wreck with the sinking floor, leaky roof and rotten side and made it into a thing of beauty with an added veranda as well! 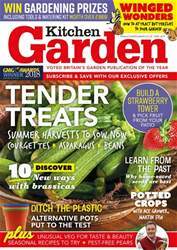 We are enjoying our first year’s subscription to Kitchen Garden and looking forward to putting all our new knowledge to good use this coming growing season. Louise Freeman, Stoke-on-TrentTONY SAYS: Wow! Now that’s what I call a labour of love!